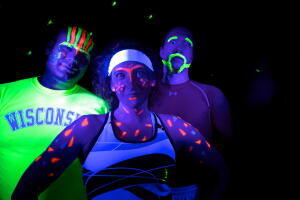 We invite you to Fleet Feet Sports Madison on Saturday, February 9th, 2013 at 8:30pm, yes PM, for the Running Party of 2013! There is a new race coming to town in May, the facelift will be completed at the store, the Brooks Pure Project is here, and spring training and racing is right around the corner. This all adds up to a reason for a party! We will provide beverages, a DJ for the dance party, prizes and more! Brooks and Race Day Events will supply glow sticks, so be ready for a sneak peek of the It’s Glow Time 5k on May 11th in Madison. What: A party to celebrate how great 2013 is going to be! Races, training and fundraising! Why: To thank you again for another great year in this awesome community of fitness! Dress Code – There is no run, so you can dress like it’s Saturday night! Please invite your friends, so they know why Fleet Feet Sports Madison was named Best of Madison “Fitness Shop” in 2012. We like to have a good time, while promoting community events and helping you train for races! There will be race directors and coaches dancing that evening, so if you have questions about training for 2013, just ask them. Thanks to Capital Brewery, Race Day Events and Brooks for their support of Fleet Feet and the party! Please RSVP by February 6th -Sorry we have reached capacity.